No, I’m not going off on some weird artistic tangent with my photography. I just wanted to use this opportunity to chat to you about electricity. If you’re a man, you may disregard this post, as Noisette tells me, somewhat condescendingly, that all men know this kind of thing. More power – no pun intended – to you! After chronicling my findings for you by taking the above picture (prompting ridicule from my family for photographing the trash) I set out to investigate. What had transpired is this: 9-year old Sunshine, having bought a new CD for herself, wanted to listen to it in her room. Faced with the plethora of plugs and adapter-studded outlets typical for our entire house, she pushed the power supply for the CD player into the socket it seemed to fit in best. It did fit, but nothing happened, and so she complained to Noisette. Actually, she first complained to me but I sent her to Noisette, claiming “technical things” are his domain. (I’m aware that I’m perpetuating the typical image of a technically challenged woman but when there is a chance to get out of at least one to-do, I’m unashamedly seizing it!). Noisette, surveying the situation, chastised her for frying the power supply by using the wrong voltage, then threw it away. I will now pause briefly for you to contemplate the time you fried one of your appliances after moving countries. In fact, for all of his bristling about men and their supposed knowledge, I should disclose here that Noisette did the exact same thing to our CD player (not just the power supply, but the entire thing, which was much more expensive than Sunshine’s faux pas, I might add) when we moved here. 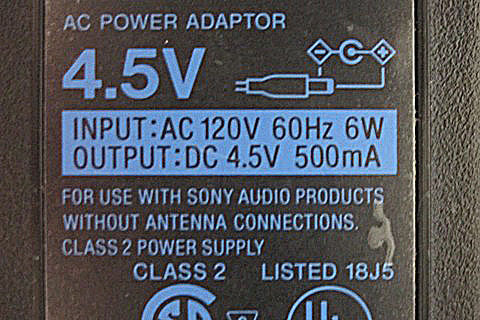 Your power supply should look similar.This one here is only good for 120V. If you live in the United States or Canada (or I think perhaps also Japan and Taiwan) the electricity coming out of your wall socket will have a voltage of 110V (or, lest someone correct me, between 100V and 127V, but I think we can all agree that 110V is good enough). In any other place on Earth the voltage will be 220V to 240V (again, let’s just stick with 220V). Let me just interject here that I think I can safely speak for all expats that this is incredibly stupid. Our lives would be so much easier if there was just one standard. 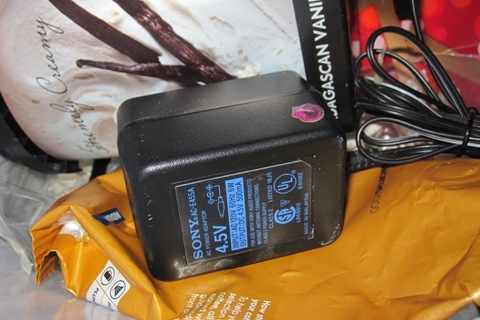 By now, some manufacturers have figured out that people do occasionally want to move and so they’ve built their devices with dual voltage (a tiny switch on the back, which is what Noisette failed to notice on the above occasion) or a voltage range from 100V-240V. Most computers, e-readers, electric toothbrushes, cell phones, and some DVD players fall into this category. So, when you move, check all your devices (or rather not the device itself, which is often running at a step-down voltage, but the power supply for the device) to see if voltage is going to be a problem. For those appliances where it is, you now have the option of either a) buying all new ones once you get to the new country or b) buying a transformer to make the old ones work. This is where the lesson for Sunshine was necessary: An adapter plug is NOT a transformer! 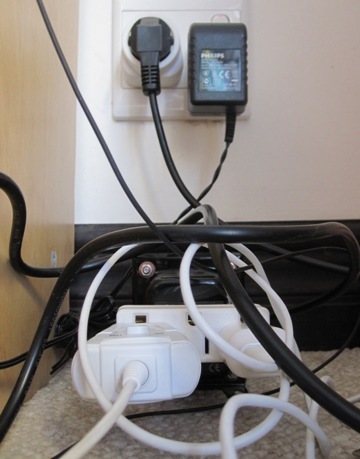 Just because a plug fits into a socket doesn’t mean the socket has the right voltage. I.e., your cell phone, if you’re coming from the U.S., will not fit into a South African outlet, but using a simple adapter plug such as these ones we bought will make it work, because your cell phone will accommodate both voltages. But things that only run on 120V should only ever be plugged into an actual transformer, which is a big heavy humming box you can’t miss. However, when you buy a transformer, you’re still not home free. You need to make sure whatever it is you want to plug in doesn’t use too much power. The more power you need, the bigger (and heavier and more expensive) the transformer gets, so it really only makes sense for low-power appliances. A toaster is borderline, and a hairdryer will probably be too much. Those things you should buy new. It’s easy to check power usage by looking at your appliance and checking the number before W (for Watts). Then find out up to which wattage your transformer will work, and try to stay safely below that. The outlet thing wouldn’t be so confusing if South Africa didn’t add to the complication by insisting on a type of power outlet that hardly fits anything you can buy, even here in South Africa. So, you will go to the store and buy a vacuum cleaner, and come home to find out the plug doesn’t fit, because it is a Euro plug. Therefore, you have to use an adapter plug, which is where our handy dandy universal adapter plugs come in. But since we use the same adapter plugs for our U.S.-based appliances, we’ve created the situation in our house where the same looking outlet supplies two different voltages, one directly from the wall, the other behind a transformer. If you get what I mean. By the way, another thing that won’t work with a transformer is a radio alarm. This is because electronic clocks are often calibrated around the frequency, and that also varies between countries (i.e. 50 Hertz vs 60 Hertz). Running your American alarm clock on a transformer here in South Africa will make it go too slow. As I’ve mentioned elsewhere, you best buy a battery operated alarm, or use your cell phone. And just if I haven’t managed to be confusing enough, TV standards are yet another Pandora’s box. There is NTSC in North America, and PAL elsewhere, and a TV running on NTSC will not function here in South Africa, unless of course it is a multi-system TV, as all TVs should be, but sadly aren’t. So even if you figure out the whole power thing, your TV (and DVD player) might still not work here. Since TVs are so much cheaper in the U.S. than here, it is well worth your while to acquire a multi-system one before moving here, which you should then be able to use when you move back. Whew! I’m glad we had our little power talk. I might have discouraged you from moving to South Africa, ever. Previous PostPrevious How Many Cattle does your Household Own?